5) Implement the solution, or at least get moving on it (it’ll be a many-sessions-long implementation). So far, i have done 1, 2, and 4. The dishwasher is churning merrily away, and J thinks that my solution is narratively sound, so that’s what i’ll be working on today. It is a variant on the little-e-in-year-four model, for those who have heard me whine about little e and its multitudinous variants. My preferred method of writing is what is called, in the NaNoWriMo world, “pantsing,” or writing by the seat of one’s pants. i like to make a person, give them a background and discover their personality, and then plop them down and watch them go. Give them some stimuli, some relationships, some conflict, and see how they manage. What solutions do they come up with? What decisions do they make? How do they surprise me, and what does it mean? Then repeat. This isn’t working for Rixi right now. i got into a terrible muddle about two years ago with a nasty nest of continuity errors, and now i have about a dozen partially-written versions of the events in my head, and they are all simultaneously true. It’s like a forked universe; all possibilities are actually happening in one parallel reality or another, but i am omniscient and am hyper-aware of all of them. They blend together. It’s like a terrible dream, where realities that are unrelated in waking life collide and conspire and conflagrate. So my preferred method—Just Write—isn’t working. Neither is Just Write’s better-behaved sister, What About, who starts with a specific idea or solution rather than a blank slate. Often, if Just Write doesn’t work, What About will come up with an idea, and that will jump-start a similar organic approach, but from (or to) a particular concept or event. i can plan, and lead up to, or develop away from, something specific, rather than just explore and see what happens. But What About is not working either; that’s where i got the dozen versions that are now all simultaneously true. What’s left? The sisters’ rigid cousin, Outline. Oh, i hate her. She is uppity and legalistic and joyless. She refuses spontaneity, scowls at discovery. 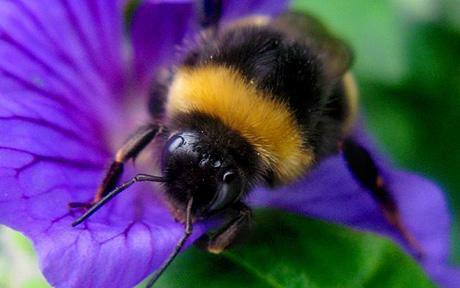 But her cousins are flitting about at random, and i can’t make them behave. Entre Outline, bane of first drafts, and the muse who brought me yesterday’s solution. Now i have not only a concrete place to start, but a concrete place to go, and sign-posts along the way. Will this steal my joy in the writing? Hardly. i am well beyond first drafts; i am in deep, tempestuous waters. Outline, rigid and demanding though she is, will see me to shore. She will provide a heading. She will, in the final analysis, restore my joy, as i begin to see land ahead through the fog and the lashing rain. So that is 4 on my list for today. For Thing 2, i debated for a moment whether i should read something fiction or something nonfiction. i decided on nonfiction, primarily because if i start fiction i will never stop, and because i received a bundle of writing books in the mail yesterday and i am eager to dive into them. They are all by James Scott Bell, who is the Writer’s Digest‘s Instructor of the Month right now. (There was a sale.) The books are Conflict & Suspense, Plot & Structure, Revision and Self-Editing for Publication, and The Art of War for Writers. i didn’t feel quite ready to dive into something specific and heavy, so i picked up The Art of War. So far, four maxims in, i can already see that this book will benefit me. Most of what i have read at this point is about diligence and hard work and discipline. Here is one bit that particularly stood out. So, i go on to my writing craft—a half-hour challenge to exercise languishing muscles, and then a deep, deep dive into those tempestuous waters. Outline, come to my aid! i very nearly gave up this week. And then i didn’t. In order to keep myself going on the Twiry stories, i finally sat down and mapped out which story ideas would make the cut and then put them in order. Then i wrote a story and a half. i’m now on number seven. i’m still stuck on the eponymous chapter, however. Part of my problem with Twiry Glitterwing and the Moss Palace has been that i’m not sure i’m getting the tone right—it doesn’t feel like i imagined it would. And part of the problem is that i don’t know for the life of me what the moss palace should be like—where it is or how it looks. i decided that that story should be the last chapter, to sort of end at a high point, where there isn’t anywhere else to go. But if i can’t figure out the moss palace in the next few days i’ll probably be forced to insert another story in the middle somewhere and end with what i meant to be the penultimate chapter—the tea party, where all Twiry’s forest friends are in attendance. i think either story would work as the last in the book (if i could figure out the moss palace itself, that is), and i think the tea party would work either as last or as second to last. So it’ll work out. But if i scrap the moss palace, i’ll have to come up with another story idea and change the name of the book. No big deal, but still, things that’ll need doing. Meanwhile, since i don’t particularly want to be writing Twiry, i’ve been spending unnecessary mental energy on another book that i have no intention of writing anytime soon and which hadn’t really occurred to me as a real option until halfway through October. i didn’t have time to think out an outline before Nano at that point, and i wasn’t sure which time period it would cover, so i couldn’t get started writing it, but now that i am stuck writing something else, ideas for this other novel keep coming to me. The other novel that i’m considering writing is centered on Alandros. He’s Rixi’s best friend’s magic tutor. i really like him as a character. The original reason i thought of him as an option at all, though, was the simple fact that he’s in his late 30s and it would give me a chance to write someone closer to my own age. But that he’s also a powerful Deteer in a well-positioned town with a lord who’s very politically important also gives me an opportunity to write a story with high-level intrigue and action. Of course, therein lies one facet of the rub (if that’s a valid metaphor, mixed as it is): i don’t really pay attention to fight choreography in the shows and movies i watch. i know when it looks cool, but i don’t analyze the moves. And i don’t tend to pay very much attention when reading that stuff, either. i get the gist, but i’m not a strategist. So it would be a challenge to learn to write the battle scenes well. On the other hand, i’m going to have to write scenes like that for the next book in the Lily Cycle, also, so practicing on Alandros may not be a bad idea. Anyway: The brilliant idea i got this afternoon was to tell the Alandros story as two parallel stories. One, a present-day struggle (siege or civil war), and the other, his first year or so as a black robe (graduate) Deteer. That would allow me to develop his character more fully—we’ll see what makes him tick and why he ticks that way. It’ll also give me the chance to use my YA voice, while contrasting it with an adult voice for the same character—a fascinating study, and a good writing challenge. i was talking this over with Jonathan at dinner, and thought up another twist on this idea. i could write the parallel stories as Alandros’ youth and the siege (i understand this might be a very opaque reference), and then write a second book as his experience in the civil war (another opaque reference). The siege is a very simple thing, much easier to do in half a book than it would be to delve into the strained relationships and the morass of motives between the bevy of political players that exists in any civil war. The civil war can hardly be told in half a novel, but it could certainly be told in a full novel (if kept to a single perspective). You know, depending on how things turn out. i am writing living history, after all; not all details are clear yet. And that’s another reason to use the siege, rather than the civil war, for the parallel stories: The siege has already happened. The civil war is only just heating up. So if i used the siege, i could pretty much start writing this book anytime. No waiting, just outlining. i sort of like the idea of having a book plot in mind for a year before writing it, however. It might be well-formed by next November. Neither Durom Falls nor Twiry were well-formed before i began writing. It’s not a work’s death knell, but “measure twice and cut once” can be applied to any project. Summary: i made no progress on Twiry today. But i have a lot of great ideas for a completely unrelated project. When i first came across this quote, my immediate thought was writing. Honestly, stories in general, including many i have not written, but writing in particular. i love storytelling, making people, watching them grow and unravel and grow again. The process, however, is often painful or simply frustrating. The Twiry stories are not working out like i’d wanted them to. They aren’t bad at all—they just don’t feel like what i’d imagined. And this is the problem with writing in-world artifacts. The stories have a life of their own in Nirth already. i am not trying to write something new, but to find something already well-loved by people in another world. The concept of sehnsuct is behind much of my love of story, as is the theme of redemption. Haunting beauty. All things made right. The world as it should be, but isn’t. 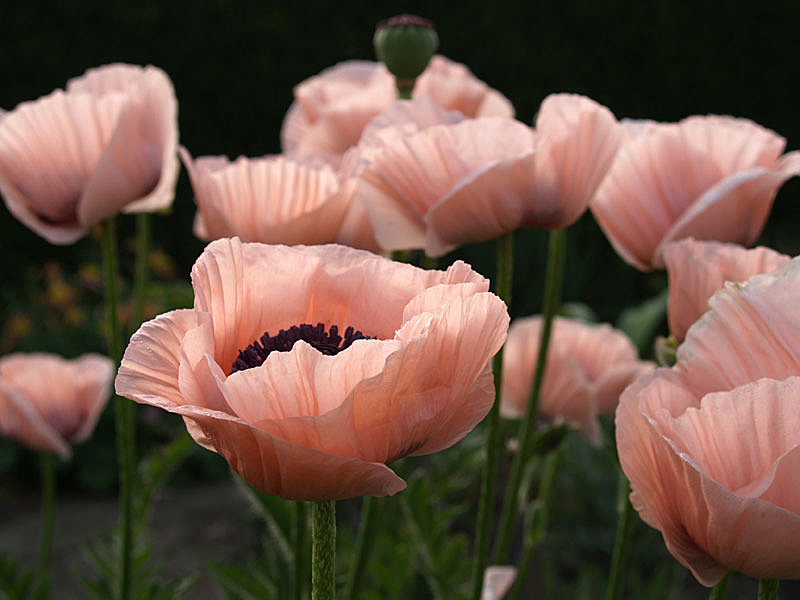 Incarnation: the deep longings of every heart, given form. i don’t know how to do that, but i desire it deeply. 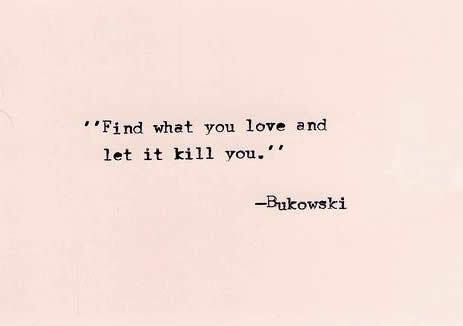 And it kills me. It kills me to read it, it kills me to attempt it, it kills me to achieve it, and—much more often—it kills me to close my hand on air, over and over again, thinking i’m close but finding i’m not. Give me a few months and i might like Twiry better. i feel fairly desolate right now. But i will press on, because Nano demands it, and because i have made promises. Next time i write a picture book, however, remind me to write it with pictures. The second thing i’ll be writing this month is part of a longer saga of heartache-in-writing: Rixi, in a critical and wrenching moment that won’t end. Oh, Rixi, why do we hurt each other? For now, though, i am only 5830 words and four stories behind schedule. And tonight is a write-in. And i will make it, somehow. If writing kills me (and let’s be honest; it won’t), it’ll be because i let it, not because i can’t get up again. Jonathan and i were gone this last weekend on a sightseeing train trip through the mountains. Consequently, neither of us got any writing done. But it was a marvelous trip, and i don’t regret it one bit. i spent this morning at my favourite writing spot: Genoa Coffee & Wine. After some shop-talk with the barista regarding coffee origins and roasting, i settled down to finish story two and write story three. At this rate, however, the Nano calculator tells me i’ll be finished by December 14. Obviously, i have more catching up to do! Nano is well underway. Jonathan, Cassie, and i had a little kickoff party of our own, involving Chinese take-out, two cats with assumptions, and a coffee break halfway through. So far, Twiry has Happened, discovered the joys of jumping and twirling, met a chickadee, found a mint patch, observed a lady-beetle, fallen asleep, and awakened to a buzzing sound. All that in only 2348 words! i’m one and a half chapters in. Stay tuned! Now, who wants an excerpt? A little bird came by just then, as the little fairy was fluttering her wings, and it called out to her. “Twee-twee! Twee-twee!” just like that. She looked up and saw it watching her from the tree above. “Twee-twee!” it sang again. Twiry thought it was saying her name: “Twiry! Twiry!” so she sang back to it: “Birdy! Birdy!” The bird thought this was a very fun game. It hopped closer, onto a lower branch, and called again: “Twee-twee! Twiry!” Twiry was so happy that she jumped up into the air and spun around three times, and then she landed—flimp-bump!—in the grass. The bird took wing and fluttered a little closer. This time it landed on a very low branch, although a very low branch is still rather high for a tiny fairy girl. “Twiry! Twiry!” it sang. Twiry jumped up from the grass and spun around again. “Birdy! Birdy!” She was very pleased with this new game. She wanted to get a little closer to the bird, and to try out her new wings, so she fluttered and jumped all at the same time, and then she was flying! She flew right up, fluttering and zipping just like a little pink dragonfly, until she was able to land on her tippy-toes at the end of the branch where the bird was sitting. It was a very handsome little bird, with a black head and beard and a creamy chest. It was not very much bigger than Twiry. Now that i’ve gotten the fairy-dust out of my system for the night, it’s time to go watch some vampire-slaying. Today i finished reading the Pooh stories (those in the two books of stories by A.A. Milne), and read one the first of the Pooh stories by David Benedictus. i was not at all impressed with Mr. Benedictus’ stories. i wanted to quit halfway through the first story (or maybe sooner), which is why i didn’t continue reading. Well, that and i really needed to get to reading the Beatrix Potter stories. i believe i shan’t bother with Mr. Benedictus’ stories at all anymore. His dedication poem at the front of the book wasn’t bad—rather touching—but even his introduction demonstrated that he hadn’t gotten the voices right. i hope he didn’t reward himself with any chocolate biscuits, although i suspect he did. Meanwhile, i really didn’t enjoy the stories in The House at Pooh Corner, either. They were sad from the beginning and felt like they were harder to write. They were certainly harder to read. Not bad, but not free and careless and young. They felt older. i think this means that i like stories written for four-year-olds better than the ones written for eight-year-olds who already know about Factors and Knights and Suction Pumps and Brazil. After i finished reading the stories, i did the math. This is not the fun part, but it is the instructive part. The shortest of Miss Potter’s stories was The Tale of Mr. Jeremy Fisher, which was only 807 words long. The longest, though, was The Tale of the Tailor of Gloucester, which i have personally read dozens of times, thanks to a good friend of mine named Naomi, who is older than Jonathan and i put together although she is only eight. That one is 3022 words long. Seeing that, i decided the best thing i could do was ignore the shortest and longest. Then, i had a range of 899-1301 words (between The Tale of Two Bad Mice and The Tale of Mrs. Tiggy-Winkle). The average of the longest and shortest came out to be 1758, and the average of the second-longest and second-shortest came out to be 1100 exactly, so i added the two averages together and averaged them again and came out with an averagey-average: 1429. Coincidentally, 1429 is exactly the length of the second-shortest Pooh story. i did the same thing with the Pooh stories, speaking of which. The longest of them is the one where they find the North Pole, at 3022 words, and the shortest is the one where they hunt the Woozle, which is 1237. That average is 2129 words. The second-longest is the one where Kanga and Roo come to the forest: 2864. The second-shortest is the one where Eeryore loses his tail: 1429 (see? same as Miss Potter’s averagey-average). So the average of the shortest and longest Pooh stories is 2129 (as i’ve said), and the average of the second-shortest and second-longest is 2146, and those are much closer together than the averages i found in Miss Potter’s stories. The averagey-average of the Pooh stories is 2138. 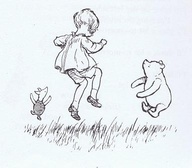 Then i realized that Pooh is always making up hums, and as i don’t imagine Twiry singing little songs (although she might; i haven’t asked her yet), i thought i’d better subtract the length of the longest hum from the averagey-average, to be safe. Then i had a modified averagey-average of 1957 words. After that, i averaged the averagey-averages (using the modified one for Pooh, not the one with the hums) and found that that was 1693 words. So all in all, i came up with a target word count for the individual stories: 1700 to 2000 (1700 being closer to the average averagey-average and 2000 being the modified averagey-average from Pooh). So my final target word count for the whole book—now pay attention—is 17K-20K. i was surprised to see how much variance there was in story length in the works of both authors. i never realized how uneven the stories were. Even still, i wanted a tight range so as not to be undisciplined; i didn’t want my stories to wander. So i will be pretty strict with myself. The rest of the words (30K-33K) will be taken up with the Rixi adventure. 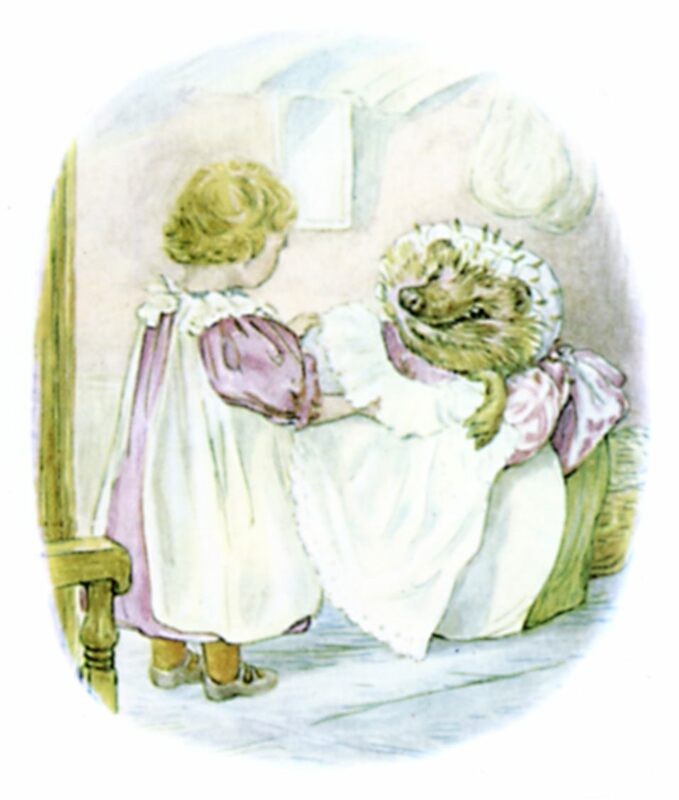 i leave you with this image of Mrs. Tiggy-Winkle and Lucie. Mrs. Tiggy-Winkle is one of my favourites.